Size: - 0.21 oz/ 6 g Milk Makeup Highlighter in Lit What it is: A universal highlighter to brighten up skin. 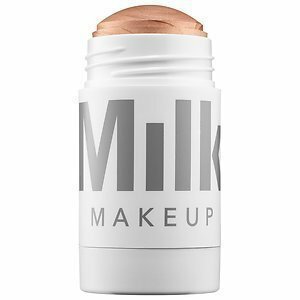 What it does: Milk Makeup's Highlighter features a blendable micro-shimmer with natural oils for added hydration. Infused with mango butter, peach nectar, and avocado combined with Milk Melt Technology, it absorbs instantly on contact with body heat-leaving skin with a glowing appearance. What it is formulated WITHOUT: - Parabens - Sulfates - Phthalates What else you need to know: Milk Makeup is a paraben-free, eco-conscious, innovative product line made of the best possible ingredients. They see beauty in originality, authenticity, and design multiuse products for self-expression. Milk Makeup's Highlighter features a blendable micro-shimmer with natural oils for added hydration. Easy to apply creamy stick highlighter makeup. If you have any questions about this product by MILK MAKEUP, contact us by completing and submitting the form below. If you are looking for a specif part number, please include it with your message. KIKO MILANO - Contour Stick: creamy texture and matte finish Contouring stick with a matte finish. The formula is enriched with African walnut oil and soothing pistachio extract. Color Hazelnut.